IT WORKS EVEN WITHOUT WATER! The patented dry trap prevents: bad smell, beetles. mosquito even with or without water seal. 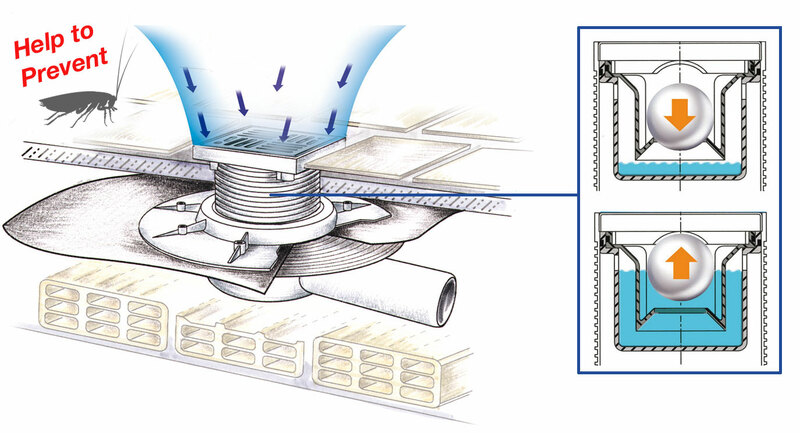 The dry floor trap is designed for drain rain water and waste water collection. Especiallly designed for balconies, terraces and in all cases of low concrete slabs. – Low casing to fit small spaces. – Round plate and flange to lock the insulating membrane. – 360° adjustable riser and PVC body. – Easy inspection for cleaning. – Slotted PP or stainless steel grill dims.100×100, 150×150 available. – Fastening screws are supplied with all stainless steel grilles (included in the package). Use: to collect rain and waste water. Especially designed for public premises, balconies, industrial kitchens, garage, public lavatories and in all cases a trapping action is required. Example of installation with insulating membrane. Trapping sphere: dry and with water.